What a weekend. This sunday I met up with the fab Panda from Studmuffin; boy is she amazing- a fab photographer, style guru, blogger, plus she bought lunch for me ;). We went to Camden and went to several markets and vintage stores; so much temptation. Plus we went to the diner, which was amazing and felt like a little kid again after having the most delicious Coke Float! Camden is the place to be, full of culture, and well it's the land of creepers- what more could you want? In the end I bought 3 beautiful rings, 3 neon fashion religion bracelets, cross bracelet and some gorgeous yellow Tapered trousers (look post for trousers up soon). 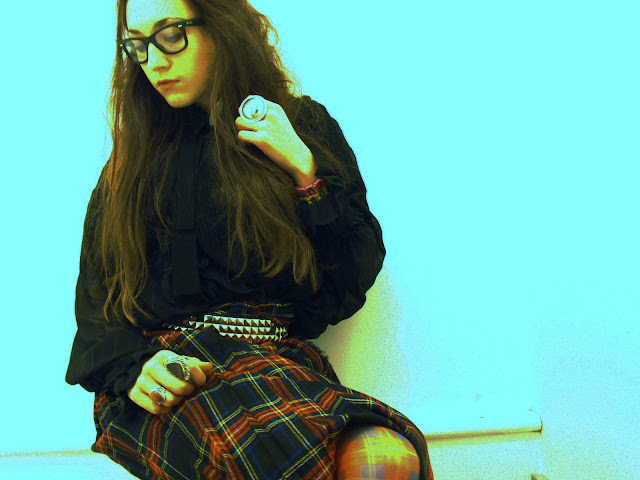 For the day I wore tartan tights, vintage tartan skirt, chiffon shirt, a bolero cardi; inspired by Rodarte SS11, mixed with grunge. By the way the online shop will open by the end of this month, just so much revision at the moment. Thanks for all the comments on the last post! I do love your outfit, all the tartan somehow works. It sounds like you had a lovely weekend, I adore spending hours wandering around vintage stores. Thanks so much for your lovely comment sweetie. fabulous photos, great english heritage style! Wow, you are so cool! Love your skirt! cute cute cute love this girly grunge. Awesome skirt! I love those bracelets. So many of my friends have them. I love Christian iconography in jewellery. I love Camden, thrift shopping so much cheaper than the highstreet. Sorry for my late reply, but life has been too hectic and busy and bla bla. And merci for following me - obviously I'm following you back, you look amaze. Your hair..oh my, I want mine long. You have a amazing blog as your Panda friend!!! so sweet! following your blog! 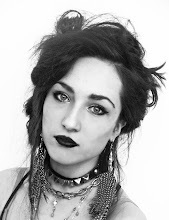 im definatley gonna follow your blog.I love the look all kinda mixed up.grunge thing.blah. you know? I love love love the jewelry! Hi sweetheart, just found your blog and have really enjoyed surfing it :) I love it, so beautiful, like you and your style :) I look forward to reading you! Cute outfit! Love the jewelry! Izzy I love this whole look, it is sooooo amazing! Seriously, I love that belt,,, raaah I want it now!!!!!!!!!!!!!!!!!!!!!!!!!!!!! Plus, you look amazing in the pictures! Awesome! Very original and chic! plaid + studs! oh how i love it. I just stumbled across your blog. Loving the plaid on plaid, and in the post above, the yellow on yellow. Would be cool if you visited me too! LOVE your glasses and skirt! you have a great blog as Pand friend!! Omg, love your blog too !